Chemical components of air pollutant exposures that induce oxidative stress and subsequent inflammation may be partly responsible for associations of cardiovascular morbidity and mortality with airborne particulate matter and combustion-related pollutant gasses. However, epidemiologic evidence regarding this is limited. An exposure-assessment approach is to measure the oxidative potential of particle mixtures because it is likely that hundreds of correlated chemicals are involved in overall effects of air pollution on health. Oxidative potential likely depends on particle composition and size distribution, especially ultrafine particle concentration, and on transition metals and certain semi-volatile and volatile organic chemicals. For health effects, measuring systemic oxidative stress in the blood is one feasible approach, but there is no universal biomarker of oxidative stress and there are many potential target molecules (lipids, proteins, DNA, nitric oxide, etc. ), which may be more or less suitable for specific study goals. Concurrent with the measurement of oxidative stress, it is important to measure gene and/or protein expression of endogenous antioxidant enzymes because they can modify relations between oxidative stress biomarkers and air pollutants. Conversely, the expression and activities of these enzymes are modified by oxidative stress. This interplay will likely determine the observed effects of air pollutants on systemic inflammatory and thrombotic mediators and related clinical outcomes. Studies are needed to assess the reliability and validity of oxidative stress biomarkers, evaluate differences in associations between oxidative stress biomarkers and various pollutant measurements (mass, chemical components, and oxidative potential), and evaluate impacts of antioxidant responses on these relations. Supported by grant number ES012243 from the National Institute of Environmental Health Sciences (RJD and NS), and grant number RD83241301 from the US Environmental Protection Agency (RJD, NS, and NV). Cardiovascular hospitalization and mortality have been consistently associated with increased exposure to airborne mass concentrations of particulate matter (PM) < 2.5 μm (PM2.5) and <10 μm in diameter (PM10) (Pope and Dockery 2006; Brook et al. 2010). Although epidemiologic studies have shown associations of cardiovascular morbidity and mortality with ambient CO and NO2 (Brook et al. 2010; Bhaskaran et al. 2009), concentrations of these gasses have been considerably lower relative to levels causing effects in experimental models, and it is possible that these gasses are serving as surrogates for other causal components from fossil fuel combustion. A recent review also reports lack of consistent findings in time series studies for the relation of ozone to daily hospital data for myocardial infarction (Bhaskaran et al. 2009). Together, these findings call for the need to better understand the underlying causal chemical components and pathophysiological mechanisms responsible for the morbidity and mortality associations (Mills et al. 2009). Oxidative stress responses to reactive oxygen species (ROS) and subsequent inflammation resulting from air pollution exposure may be one of these important mechanisms (Brook et al. 2010; Frampton 2006; Xia et al. 2006). However, epidemiologic evidence in humans that ambient PM or gaseous pollutant exposures increases biomarkers of oxidative stress is limited. The following review assesses the importance of addressing this gap to the field of air pollution research and we offer some possible methods of doing so by focusing on a few selected biomarkers that can be measured in the blood for large population studies. We will not discuss the use of other body fluids to measure oxidative stress that are reviewed elsewhere, for example exhaled breath condensates (Silkoff et al. 2006) and urine (Cooke et al. 2002). We also focus on inhalation and pulmonary deposition as the route of exposure for cardiovascular effects of interest in the paper (we do not discuss dermal, gastrointestinal, or transplacental routes). Finally, the air pollutants of primary focus in the review are those associated with particles. Oxidative stress is a biochemical imbalance in which production of ROS exceeds the natural antioxidant capacity. This imbalance can occur in the body following exposure to pro-oxidant air pollutants (Fig. 1). Given this balance between oxidants and antioxidants, a threshold level for exposure to the pro-oxidant pollutant might be expected to lead to a measurable oxidative stress response. In the presence of oxidative stress, uncontained ROS cause tissue damage and dysfunction by attacking and denaturing structural and functional molecules (lipids, proteins, carbohydrates, DNA, RNA, NO, etc.) and by modulating the activities of redox-sensitive transcription factors (e.g., nuclear factor kappa-light-chain-enhancer of activated B cells (NFκB), AP-1, and signal transduction pathways). In general, the first line of defense against oxidative stress is via antioxidant enzymes and proteins involved in phase II detoxification. This response is regulated by the nuclear factor-erythroid 2-related factor 2 (Nrf2)/antioxidant-response element (ARE) pathway. The pathway is activated when signals from oxidative and electrophilic chemicals modify Kelch-like ECH associated protein 1 to release Nrf2, which then moves to the nucleus and activates the expression of genes with ARE that include antioxidant and phase II genes. This is a key pathway in responses to toxic pollutants (Kensler et al. 2007), and is important in mitigating oxidative stress-induced endothelial dysfunction (Mann et al. 2007). When these defense mechanisms are overwhelmed at higher levels of exposure-induced oxidative stress, pro-inflammatory effects follow via the activation of NFκB. Activation of NFκB increases the transcription of chemokines, cytokines and acute phase proteins that contribute to and are predictive of coronary artery disease risk (Pai et al. 2004). Nitrosative stress from reactive nitrogen species (RNS) such as peroxynitrite may also be an important driver of inflammatory responses (Shishehbor et al. 2003). Finally, cytotoxic effects could occur at higher levels of exposure (Ayres et al. 2008). Extensive data show linkages of oxidative stress and depressed antioxidant capacity with the risk of cardiovascular disease (Dhalla et al. 2000), hypertension (Vaziri and Rodríguez-Iturbe 2006), and chronic kidney disease (Vaziri 2004). Oxidative stress may play a central role in the respiratory and cardiovascular effects of air pollution through its immunomodulating effects and its ability to initiate the inflammatory process and thrombogenic activity (Dhalla et al. 2000). Experimental data shows that redox active PM components (that are especially enriched in ultrafine PM < 0.1 μm) lead to the production of ROS in various cells in the lungs, blood and vascular tissues. This is followed by oxidative stress, which can then lead to increased airway and systemic inflammation, and adverse cardiovascular responses when antioxidant defenses are overwhelmed (Ayres et al. 2008; Utell et al. 2002). Epidemiologic data directly supporting this experimental evidence is limited, but there is indirect support from studies that have examined the effect modification of responses to air pollutant exposures by variants in oxidative stress-related genes (Alexeeff et al. 2008; Chahine et al. 2007; Islam et al. 2008, 2009; Park et al. 2006; Ren et al. 2010; Schwartz et al. 2005). There is also some epidemiologic evidence that PM exposure significantly increases biomarkers of oxidative stress in blood, but the data are limited for susceptible populations exposed to urban air pollution. The epidemiologic evidence include panel studies of healthy subjects with few repeated measures (Chuang et al. 2007; Liu et al. 2007; Sørensen et al. 2003, 2005; Vinzents et al. 2005), and studies of workers occupationally exposed to combustion aerosols (Autrup et al. 1999; Kim et al. 2004; Lai et al. 2005; Rossner et al. 2007, 2008a, b; Sharman et al. 2002; Singh et al. 2007). The oxidation of low density lipoprotein (ox-LDL) has been found to be increased among people exposed to environmental tobacco smoke (Panagiotakos et al. 2004), which may carry redox active components similar to those in urban air. Urban air pollution has been linked to increased ox-LDL in mice (Soares et al. 2009) and impairment of the anti-inflammatory capacity of high density lipoprotein (HDL) in mice (Araujo et al. 2008). This effect may play a role in the pro-atherosclerotic effects of air pollution that have been found using experimental models (Araujo and Nel 2009; Chen and Nadziejko 2005; Sun et al. 2005; Suwa et al. 2002), and have been evidenced in epidemiologic studies showing increased risk of atherosclerotic lesions among subjects living near busy traffic (Hoffmann et al. 2007; Künzli et al. 2005, 2010). Evidence for the important role of antioxidant reactions (discussed below) in vivo is that alterations in antioxidant enzyme activities have been associated with cardiovascular (Espinola-Klein et al. 2007; Förstermann 2008; Fukai et al. 2002), renal (Vaziri 2004; Vaziri et al. 2009), and respiratory disease pathologies (Rahman et al. 2006). More recently, meta-analyses of published human studies identified a strong, inverse association of superoxide dismutase (SOD), glutathione peroxidase (GPx-1), and catalase enzyme activities in blood with coronary artery disease risk in people (Flores-Mateo et al. 2009). Such chronic antioxidant enzyme deficiencies raise the susceptibility to and increase the severity of tissue injury in response to oxidative stress. However, acutely, up-regulation of antioxidant enzymes can be a marker of responses to pollutant exposures denoting ROS/electrophile-induced Nrf2 activation. The antioxidant activity of key proteins can also be used as an indirect measurement of oxidative stress under the assumption that it is a protective response. For example, this approach has been used with heme oxygenase-1 (HO-1) gene and protein expression in leukocytes exposed in vitro to particle mixtures (Li et al. 2002). HO-1 catalyzes the first step in heme degradation, and produces a general response to oxidative stress induced by ROS via the production of biliverdin which is a potent antioxidant molecule (Ryter et al. 2006). Other key antioxidant enzymes include the glutathione S-transferases (GSTM1, GSTT1, and GSTP1), which are critical for the detoxification of xenobiotics including polycyclic aromatic hydrocarbons (PAH)-epoxides (phase II reactions) through the mercapturic acid pathway (Keen and Jakoby 1978). They also protect cells from protein, lipid and DNA oxidation products by the conjugation of harmful electrophiles to glutathione (GSH) (Bogaards et al. 1997; Hayes and McLellan 1999; Hayes et al. 2005). In human lung epithelial cells and in leukocytes, GSTP1 contributes most GST-derived enzyme activity, whereas GSTM1 is highly expressed in lymphoid cell lines and GSTT1 in erythroid cell lines (Fryer et al. 1986; Wang et al. 2000). Oxidant air pollutants can also induce NADPH quinone-oxidoreductase (NQ01) expression. NQ01 detoxifies highly reactive quinones to hydroquinones (Monks et al. 1992), but some of these hydroquinones may still be reactive (Ross et al. 2000). Mitochondrial manganese superoxide dismutase (MnSOD), extracellular Cu,Zn-SOD (extracellular SOD), cytosolic Cu,Zn-SOD, GPx-1, and catalase (CAT) are part of the frontline defense against ROS. SOD converts superoxide radicals to H2O2, whereas CAT and GPX1 catalyze the reduction of H2O2 to water and molecular oxygen. Superoxide anion scavenging activity in erythrocytes is driven largely by cytosolic Cu,ZnSOD since they lack mitochondria. extracellular SOD is the predominant SOD isoenzyme in plasma and its gene is 60% homologous with cytosolic Cu,ZnSOD, but is minimally homologous to mitochondrial MnSOD. It is highly expressed in arterial walls, where it is produced predominantly by smooth muscle cells (Fattman et al. 2003). Diminished expression of extracellular SOD may be important in the progression of coronary artery disease (Fukai et al. 2002) and may play an important role in endothelial dysfunction in patients with this disease (Landmesser et al. 2000). Specifically, endothelial NO synthase produces NO, which traverses the extracellular space to induce smooth muscle relaxation in the vessel wall. Superoxide can react with NO to form the potent oxidant, peroxynitrite, which is likely involved in lipid peroxidation (O’Donnell and Freeman 2001). Gurgueira et al. (2002) found that rats exposed to concentrated ambient particles showed an adaptive increase in Cu,Zn-SOD activity in heart but not lung tissue. However, the standard colorimetric measurement of Cu,Zn-SOD activity does not distinguish between extracellular and cytosolic Cu,Zn-SOD (which predominates in erythrocytes and other cell types) potentially invalidating the measurement of extracellular SOD in plasma. Low hemolysis after blood cell separation could result in an overestimation of SOD as well as GPx in plasma. Paraoxonase-1 (PON1) is an antioxidant enzyme that contributes to the antioxidant property of HDL by reversing/preventing lipid peroxidation, particularly peroxidation on LDL (Watson et al. 1995), and by limiting production of oxidized arachidonic acid-derived products that lead to the formation of 8-isoprostane (Adkins et al. 1993). The antioxidant properties of PON1 are based on its capacity to hydrolyze lipid peroxidation products (Mackness et al. 1998). Production of several other enzymes capable of promoting oxidative stress may be induced by pollutant chemicals or particles that interact with cells. For example, myeloperoxidase which is released by activated neutrophils, monocytes, and some macrophages can damage lung (Repine et al. 1997; Gilliland et al. 1999) and arterial tissue (Schindhelm et al. 2009) by producing potent oxidants such as hypochlorous acid. Macrophages produce ROS as well in response to particle exposures. The cytochrome P450 (CYP) family is also important in the generation of ROS by activating inhaled toxicants via reductase-catalyzed quinone reduction (phase I reactions) (Kumagai and Shimojo 2002; Fig. 1). Microsomal epoxide hydrolase 1 as such acts in association with CYP enzymes by metabolizing PAH to highly reactive epoxide intermediates, which lead to ROS generation (Decker et al. 2009). The above data regarding cell-based pro-oxidant responses has led to the suggestion that inflammatory cell cultures may serve as indicators of the oxidative potential of particle mixtures via in vitro test systems that measure ROS production (discussed below; Ayres et al. 2008). In addition to endogenous antioxidant enzymes and ROS scavenger molecules, exogenous dietary antioxidants may also protect people from the adverse effects of oxidative stress by up-regulating endogenous antioxidant defenses (or acting as cofactors), and by their own antioxidant properties (Romieu et al. 2008). However, their importance relative to the endogenous system itself is controversial (Limón-Pacheco and Gonsebatt 2009; Viña et al. 2007; Wenger 2007). Finally, several drugs used in the treatment of cardiovascular diseases, especially statins (cholesterol-lowering medications), may inhibit the progression of atherosclerosis by their anti-inflammatory and anti-oxidant properties (Adameova et al. 2009). This may be relevant to findings in several cohort panel studies that show weaker associations between circulating biomarkers of inflammation and air pollution among subjects using statins (Delfino et al. 2009; Dubowsky et al. 2006; O’Neill et al. 2007; Ruckerl et al. 2006). ROS and RNS can lead to many different types of post-translational modifications of proteins including electrophilic modifications, protein carbonlyation, S-glutathionylation, oxidation of methionine residues, nitration, and hydroxylation of amino acids, oxidation of sulfhydryl groups, etc. (Gianazza et al. 2007). These effects have functional implications including inactivation of proteins, and downstream effects such as epigenetic changes. For example, S-glutathionylation occurs under oxidative conditions when a disulfide bond is made between a cysteinyl residue of a protein and oxidized glutathione disulfide (GSSG), or with GSH via one of the GSTs, and is reversed by thiol-disulfide oxidoreductase enzymes. This is important in redox signal transduction, in the regulation of c-Jun, JNK, and TRAF2 (apoptotic and proliferative effects), redox-sensitive thiol proteins, and proteins involved in the folding and maturing of transmembrane and secretory proteins in the endoplasmic reticulum (ER; Mieyal et al. 2008; Townsend 2007). S-glutathionylation may be a regulator of an accumulation of misfolded or unfolded proteins secondary to an increased redox state in the ER (ER stress) resulting in an adaptive response (unfolded protein response), which if prolonged leads to apoptosis (Townsend 2007). Indirect evidence that this biological pathway can be influenced by air pollutant-induced oxidative stress comes from several experimental studies that have found exposure to urban PM or diesel exhaust particles leads to upregulation of unfolded protein responses in cells from in vitro cell cultures and from lung and liver tissue of exposed mice (Gong et al. 2007; Laing et al. 2010; Watterson et al. 2009). Oxidative stress and ROS may also lead to epigenetic changes including changes in the methylation of DNA and post-translational modifications of histones (methylation, tyrosine nitration, phosphorylation, ubiquitination, and SUMOylation), which may then affect gene expression and thus protein expression. For example, in the case of corticosteroid resistance, peroxynitrite nitrates tyrosine residues on histone deacetylase-2 leading to its inactivation and subsequent decrease in its ability to deacetylate histones. This in turn leads to the increased expression of the inflammatory genes associated with the histones (Barnes 2009). Inactivation of antioxidant enzymes by electrophilic air pollutants chemicals could also be an important mechanism of air pollutant-induced oxidative stress. 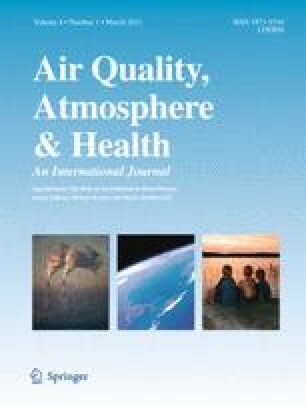 In a repeated measures analysis of 60 elderly subjects with a history of coronary artery disease, we found inverse associations of air pollutants (especially ultrafine particles and markers of primary combustion) with the activities of key erythrocyte antioxidant enzymes (GPx-1 and Cu,Zn-SOD; Delfino et al. 2008, 2009, 2010a). However, sensitivity analyses showed a small group of seven subjects with strongly positive associations (Delfino et al. 2009). Antioxidant enzymes in erythrocytes such as GPx-1 and Cu,Zn-SOD are important in protection against oxidative stress (Cimen 2008; Minetti et al. 2007; Tsantes et al. 2006). Whereas increased antioxidant proteins through the induction of genes is expected in nucleated cells (e.g., leukocytes) in response to oxidative stress, erythrocytes are unable to do so. It is possible that certain particle components can inactivate enzymes due to their electrophilic properties. We hypothesized that erythrocyte antioxidant enzyme inactivation by electrophilic components in air pollution is a possible explanation for our findings. Oxidative stress would be more likely as a result. Specifically, erythrocyte antioxidant inactivation could lead to pollutant-related increase in biomarkers of inflammation such as interleukin-6, which we also found was positively associated with air pollutants (Delfino et al. 2009). Interestingly, GPx-1 was also inversely associated with interleukin-6. In vitro data has shown enzyme inactivation by pollutant components or ultrafine particles (Hatzis et al. 2006; Pigeolet et al. 1990). We recently conducted preliminary in vitro tests that showed pollutant-induced inactivation of the GPx-1 enzyme (Staimer et al. 2010). Compared with control conditions, GPx-1 activity significantly decreased when treated with an electrophilic chemical (p-Benzoquinone) and with extracts of PM2.5 particles collected on quartz filters at a downtown Los Angeles monitoring location. Other in vitro studies have shown irreversible inactivation of the thiol enzyme GAPDH by extracts of concentrated ambient ultrafine particles and diesel exhaust particles (Shinyashiki et al. 2008, 2009) as well as vapor phase ambient chemicals (Eiguren-Fernandez et al. 2010; Iwamoto et al. 2010). Some electrophilic chemicals in traffic exhaust are anticipated to lead to the inactivation of enzyme’s catalytic activity by covalent bond formation with nucleophilic (electron donor) functions of proteins. Enzyme inactivation may also occur through oxidation of protein cysteine residues by oxidant chemicals in vehicular emissions leading to irreversible oxidation products (Kumagai and Shimojo 2002). In vitro data suggests that organic constituents and transition metals (e.g., Fe, Cu, Ni, and Zn) in PM are capable of generating ROS directly (Ayres et al. 2008; Cho et al. 2005; Ntziachristos et al. 2007) or as a result of their capacity to activate neutrophils or other leukocytes, alveolar macrophages, respiratory epithelial cells, and endothelial cells. Transition metals have known potential to induce oxidative stress through Fenton reactions. Cellular generation of ROS from exposure to PM mixtures has been demonstrated using an in vitro system of rat alveolar macrophages (Verma et al. 2009a, b). Important reactive chemicals may include PM2.5 organic components such as quinones that are themselves oxidizing species or PAH that undergo bio-transformation by cytochrome P-450 1A1 to quinones, which can induce oxidative stress (Bonvallot et al. 2001). Diesel exhaust particles are enriched in these redox cycling components (Shinyashiki et al. 2009). Automobile exhaust produces nearly the same set of components (Phuleria et al. 2007) and is responsible for a majority of mobile-source PM emissions in the USA (Gertler 2005). Experimental data show that PAH and oxidized PAH (e.g., quinones) from diesel exhaust particles promote the generation of ROS leading to oxidative stress and NFκB activation with resultant inflammatory responses (Riedl and Diaz-Sanchez 2005). These exposures also lead to changes in antioxidant enzyme expression as shown in studies of airway responses in human subjects (Behndig et al. 2006) and with in vitro data (Li et al. 2002). Such effects may underlie epidemiologic findings (including our own) of increased markers of vascular hypercoagulability and circulating inflammatory markers in relation to exposures to markers of traffic-related air pollutants (e.g., elemental carbon) in cohort panel studies (Delfino et al. 2008, 2009, 2010a, d; Ruckerl et al. 2006; Yue et al. 2007), in cross-sectional studies (Madrigano et al. 2009; O’Neill et al. 2007). This view is supported by results from a panel study of 60 elderly subjects described above showing that associations of plasma interleukin-6 (IL-6) and TNF-RII with PM0.25 mass were completely confounded by the PAH fraction of PM0.25 (Delfino et al. 2010d). Both indoor and outdoor home concentrations of low, medium, and high molecular weight PAHs were significantly associated with these biomarkers of systemic inflammation. Chemical mass balance model results using source tracers suggested that a majority of the PAH came from vehicular sources (Arhami et al. 2010; Delfino et al. 2010d). Another interesting study found associations between the traffic-related air pollutant, black carbon (BC), with plasma homocysteine levels, which is a risk factor for cardiovascular disease (Park et al. 2008). Authors suggested mechanisms to explain their findings, including an involvement of pollutant-generated ROS or inactivation of enzymes involved in homocysteine remethylation. These findings are consistent with a recent extensive review of the literature that concluded “vehicular emissions are a major environmental cause of cardiovascular mortality and morbidity in the United States” and that a PM2.5 BC standard should be considered under the US National Ambient Air Quality Standards (Grahame and Schlesinger 2010). Particle size fraction is also an important determinant of the dose of redox active chemicals delivered to target organs. The ultrafine (<0.1 μm in diameter) and accumulation modes (0.1–2.5 μm) make up total PM2.5 mass (fine particles), which is regulated by the US Environmental Protection Agency (EPA). However, ultrafine particles are expected to induce greater responses per unit mass than larger particles that dominate PM2.5 mass. This has been attributed to higher deposition and retention in the lungs, ability to evade phagocytosis by surface macrophages, and magnitudes higher particle number and surface area than larger particles, thus delivering to the lungs greater concentrations of toxic components (Ayres et al. 2008; Delfino et al. 2005; Mills et al. 2009; Oberdörster et al. 2005; Schmid et al. 2009; Geiser and Kreyling 2010). Because of this surface area, ultrafine particles carry redox active organic chemicals (e.g., PAH) and transition metals in much higher concentrations than larger particles (Sioutas et al. 2005). Even for soot particles with low organic content, ultrafine particle–cell interactions can be an important pro-oxidant mechanism inducing inflammatory responses, especially in the lungs, possibly due to the large reactive surface area of carbon (Schmid et al. 2009). Therefore, toxic particle components and effective surface area are not well-represented by EPA-regulated PM2.5 and PM10. Nevertheless, a few cohort panel studies still showed associations of biomarkers of oxidative stress with PM2.5 or PM10 mass (Chuang et al. 2007; Liu et al. 2007; Sørensen et al. 2003). However, there is limited epidemiologic evidence in humans relating well-characterized PM exposure to increases biomarkers of oxidative stress in blood. Two small panel cohort studies showed oxidative DNA damage (mainly 8-oxodG) in lymphocytes from exposure to increased ultrafine particle number concentrations (Vinzents et al. 2005) and PM metals (Sørensen et al. 2005). However, sample sizes were small in part due to the difficulty in performing the 8-oxodG assay on freshly isolated lymphocytes. Translocation of ultrafine particles into the circulation has been shown in several studies, and despite the very low overall rate of perhaps ≤1%, the effect on target organs may be important given the high surface area and long retention times (Schmid et al. 2009; Geiser and Kreyling 2010). The high retention of ultrafine particles in the lungs shown in a recent study (Möller et al. 2008) suggests that a much greater impact is via the translocation of particle components to the circulation. This may lead to sustained effects through the gradual transfer of potentially redox active components to the circulation over many days. This could be particularly important for chemicals like PAH that require biotransformation by phase I enzymes (Fig. 1). Larger particles, including coarse particles, may have a greater impact in the lungs given that pro-inflammatory components in fine or coarse particles are efficiently delivered to the target airways. This is supported by an experimental study showing that aspiration of coarse particles collected both near and far from a busy highway led to inflammatory responses in the lungs of mice whereas only ultrafine particles from both locations led to cardiac reperfusion injury (Cho and Kleeberger 2010). Results in the cohort panel study described above for size-fractionated particles showed that only quasi-ultrafine particles <0.25 μm (PM0.25) were significantly associated with systemic biomarkers of inflammation [IL-6 and tumor necrosis factor-α receptor II] (Delfino et al. 2009) and with ischemic ST-segment depression measured with ambulatory electrocardiographs (Delfino et al. 2010c). Furthermore, the potentially toxic components of carbonaceous aerosols are numerous and also vary considerably by location and by time of day and season, many being volatile during periods of low photochemical activity and near sources. In particular, the effects of combustion-related primary organic aerosols (POA) and their semivolatile organic compounds (SVOC) such as PAH may differ from effects of photochemically related secondary organic aerosol (SOA), which are in part derived from aged primary SVOC (Robinson et al. 2007). POA are formed during or shortly (within seconds) after the combustion of fossil fuels and are enriched in the ultrafine mode. SOA are formed from gas-to-particle conversion when volatile reactive organic gasses and SVOC are oxidized to form low-volatility products that condense to produce SOA, which is enriched in the accumulation mode (0.1–2.5 μm in diameter). Although a large part of the regulatory effort to protect public health involves regulating some of the gasses involved in SOA formation, there is little data on the importance of this characteristic of PM2.5 to cardiovascular health. Given results from experimental studies in ApoE mice (Campen et al. 2010; Lund et al. 2007), concentrations of volatile and semi-volatile organic precursor components from the combustion of fossil fuel are also likely important determinants of vascular oxidative responses important in the development of cardiovascular disease. However, there is little data regarding this for ambient or traffic-related exposures in human populations (Rossner et al. 2008a, b). We have presented data showing that biomarkers of systemic inflammation (Delfino et al. 2008, 2009, 2010a, d), ambulatory blood pressure (Delfino et al. 2010b), and ischemic ST segment depression in ambulatory ECG (Delfino et al. 2010c) are more strongly associated with POA than SOA exposure markers and chemical components, whereas a biomarker of airway inflammation (fractional exhaled NO) was more strongly associated with SOA and ozone (Delfino et al. 2010d). We hypothesized that many SOA components, which are hydrophilic and highly oxidized, have immediate pro-oxidant effects on the airways, whereas many POA components (e.g., PAH), are hydrophobic and require biotransformation to pro-oxidant species (this can occur after systemic distribution of these chemicals). These findings do not support the belief that activation of leukocytes in the lungs, followed by the release of pro-inflammatory mediators is a major (indirect) pathway to the systemic inflammatory effects of particulate air pollution (Fig. 1; Mills et al. 2009). This area of research has been extensively reviewed elsewhere (Ayres et al. 2008) and will only briefly be addressed here. The dithiothreitol (DTT) assay has been used to assess the redox potential from organic components in PM. The assay shows the capacity of PM to transfer electrons from DTT to oxygen resulting in the generation of superoxide. This redox activity is highest in ultrafine PM and is strongly correlated with elemental carbon and PAH fractions suggesting that traffic sources are important (Cho et al. 2005). Several in vitro and in vivo animal studies have shown that DTT activity of particle samples (along with strongly correlated concentrations of PAH, oxy-PAH, and polar organic chemicals) are related to ability of ultrafine PM and diesel exhaust particles to induce oxidative stress and inflammatory responses (Li et al. 2003, 2009; Shinyashiki et al. 2009). However, another potentially important mechanism of oxidative stress response to PM chemicals is the production of ROS by cells. One validated method is to assess this by incubation of rat alveolar macrophages in vitro with particle extracts and the ROS probe DCFH-DA under experimental conditions where cell injury is negligible, and then measuring fluorescence intensity to represent the oxidative generating capacity of particle extracts (Landerman et al. 2008). Macrophages are the first line of defense against pulmonary injury, including injury from pollutant particles. After phagocytizing particles, macrophages generate ROS in an oxidative burst. This is followed by cytokine cascades that result in inflammation and additional ROS production. The cell-based ROS activity induced by aqueous PM extracts in this assay has been correlated with transition metal and OC concentration in several studies in Los Angeles (Hu et al. 2008; Verma et al. 2009a) and elsewhere (Shafer 2010; Zhang et al. 2008). One of the LA studies also showed greater ROS activity for PM0.25 than larger particle size fractions (Hu et al. 2008). We recently published among the first supportive evidence for the use of PM oxidative potential as a biomarker of exposure in epidemiologic research (Delfino et al. 2010d). We evaluated the relation of airway and systemic inflammatory responses to the potential of collected particles to induce cellular production of ROS. Sixty elderly subjects were monitored with 12 weekly measurements of both plasma IL-6 (a biomarker of systemic inflammation) and offline fractional exhaled NO (a biomarker of airway inflammation). To assess PM oxidative potential, ROS production was measured as described above (Landerman et al. 2008) by exposing rat alveolar macrophages (NR8383) in vitro to aqueous extracts of PM0.25 filters collected outdoors at the subjects’ retirement community. Both exhaled NO and IL-6 was positively associated with levels of macrophage ROS generation. Co-regression models of PM0.25 mass with ROS production suggested that oxidative potential explained most of the association of IL-6 with PM0.25 mass. The association of exhaled NO with ROS activity was not reflected by PM0.25 mass concentration. We concluded that the ability of particles to induce ROS generation by macrophages is associated with both systemic and airway biomarkers of inflammation, and this association is nominally reflected by particle mass concentration. There is no universal biomarker of oxidative stress or oxidative status. Only a carefully selected panel of markers tailored for specific study goals may reflect different types of oxidative stress (Dotan et al. 2004). Furthermore, no biomarker meets all the technical requirements (cheap, non-invasive, easy to detect, chemically and biologically stable) as outlined by Dalle-Donne et al. (2006). More specifically, rapid screening methods are needed in large-scale epidemiological studies. Ideally, these methods should be standardized and cost effective with respect to biospecimen collection, processing, storage, and analysis. Thus, some biomarkers are better suited for epidemiologic studies than others. The following summarizes some of the more widely used and feasible indices of oxidative stress in large-scale human studies using blood samples (based, in part, on Dotan et al. 2004; Dalle-Donne et al. 2006, and Romieu et al. 2008) and highlights immunochemical methods for biomarker detection when applicable. Immunoassays are based on selective antibodies directed towards specific target analytes and they continue to be the method of choice for field screening methods. GSH is the most commonly used index of biological stress status (Dalle-Donne et al. 2006). It is an important intracellular scavenger of free radicals and neutralizes peroxides in conjunction with GPx-1 and glutathione reductase, thus maintaining the redox balance of cells. Furthermore, GSH detoxifies electrophiles either directly or via GST-catalyzed conjugation (Keen and Jakoby 1978). Electrophilic compounds can enter erythrocytes in vitro and deplete erythrocyte GSH, which accounts for >98% of the whole blood GSH store (Palmen and Evelo 1996). Because erythrocytes are the main source of GSH in blood, GSH level will be significantly lower in anemic patients with or without oxidative stress, therefore the whole blood GSH concentration should be normalized against hemoglobin level. Glutathione deficiency in whole blood is associated with aging and the pathogenesis of cardiovascular disease (Kharb 2003; Muda et al. 2003). Conversely, high levels of total GSH in blood is found in healthy elderly subjects (Pastore et al. 2003). Oxidative stress caused by tobacco smoke has been reflected by lowered levels of whole blood GSH, which increases 3 weeks after smoking cessation (Lane et al. 1996). Likewise oxidative stress in chronic kidney disease is associated with reduced blood and tissue GSH levels (Vaziri 2004). Measurement of both reduced and oxidized glutathione (GSH/GSSG ratio) by spectrophotometry, spectrofluorometry, and gas chromatography–mass spectrometry may be a useful tool to assess the oxidative stress status in human blood. However, the determination of GSSG in human blood could easily be overestimated if samples are not properly pre-treated with antioxidants during blood collection and blood sample preparation (Rossi et al. 2002). A comprehensive review on the analysis of isoprostanes by immunologic, gas chromatography/mass spectrometry (GC/MS), and high-performance liquid chromatography (HPLC)/MS assays has been provided by Lawson and FitzGerald (2002). 8-isoPGF2α is a major component of a family of prostaglandin-like compounds generated in vivo by nonenzymatic free radical-catalyzed peroxidation product of arachidonic acid (Taber et al. 1997). Most of the methods for F2-isoprostane quantification have focused on the measurement of 8-isoPGF2α in biological fluids (including human plasma) and are regarded as the gold standard for the assessment of free radical-mediated lipid peroxidation. 8-isoPGF2α determinations are carried out by ultra-sensitive analytical techniques such as GC-MS or HPLC-MS-MS (Milne et al. 2007). These methods have the advantage to accurately quantify isoprostane concentrations down to the picomolar range, but require sample preparation and expensive instrumentation. Immunoaffinity chromatography is an efficient sample preparation method linked to instrumental detection (HPLC-MS) (Sircar and Subbaiah 2007). Less expensive antibody-based assays are commercially available but lack specificity and matrix effects of plasma samples can drastically affect the results. However, as with any analysis, the results are dependent on how the samples were collected or handled, no matter how sophisticated and expensive the applied analytical instrumentation might be. In the case of isoprostane, the possibility of artefactual isoprostane generation due to arachidonic acid autooxidation requires precautionary measures to prevent ex vivo oxidation in blood samples prior to analysis. Malondialdehyde (MDA) can be excessively generated after ROS-mediated lipid peroxidation resulting in MDA-LDL adducts and damage to cell membranes. MDA-LDL, in addition to oxidized low density lipoprotein (oxLDL), is a key player in the pathogenesis of atherosclerosis (Berliner and Heinecke 1996). Elevated plasma MDA levels were found in patients with chronic heart failure (Diaz-Velez et al. 1996) and in patients with end-stage renal disease (Vaziri 2004). An age-dependent increase of erythrocyte MDA associated with a decline of GSH has been observed (Gil et al. 2006; Rizvi and Maurya 2007). In addition, several studies have reported an increase of peripheral blood MDA in smokers (Nielsen et al. 1997), in workers exposed to heavy metals (Jiun and Hsien 1994), in nonsmoking bus drivers (Autrup et al. 1999), and in female students after environmental exposure to air pollutants (Sørensen et al. 2003). The most widely used method to assess lipid peroxidation is the thiobarbituric acid reactive substances (TBARS) test. TBARS reacts with MDA to generate the MDA-dithiobarbituric acid adduct. However, the TBARS assay does not specifically measure MDA or lipid peroxidation and therefore it has been criticized (Halliwell and Gutteridge 1999). Significant improvement can be made to the TBARS technique by using HPLC to separate the MDA-dithiobarbituric acid adduct (Halliwell and Whiteman 2004). Therefore, lipid peroxidation in plasma should be evaluated by HPLC with fluorescence detection, which quantifies only the actual MDA-dithiobarbituric acid adduct (Lykkesfeldt 2001; Mao et al. 2006). Increased LDL oxidation is believed to play a critical role in the pathogenesis of atherosclerosis (Steinberg 1997; Heinecke 1998). LDL can be oxidized to oxLDL in vitro and in vivo by several mechanisms that affect apolipoprotein B function (Steinbrecher et al. 1987; Mertens and Holvoet 2001). The oxidative modification of LDL results in a distinctive pattern of oxidation-specific epitopes for scavenger receptors leading to macrophage foam cell formation (a key event in the arterial subendothelium leading to the development of atherosclerosis). Many studies indicate that circulating oxLDL is significantly increased in patients with coronary artery disease (Holvoet et al. 1998a, b; Toshima et al. 2000; Shimada et al. 2004; Huang et al. 2008; Kazunori and Hiroshi 2004) and those with end-stage renal disease (Vaziri et al. 2009). Oxidized LDL was a predictor of incident coronary artery disease in one cohort study (Meisinger et al. 2005); but in a large prospective cohort study, it was not an independent predictor of coronary artery disease after adjustment for LDL cholesterol, HDL cholesterol, and apolipoprotein B (Wu et al. 2006). OxLDL may be important in acute inflammatory events and as such could be a useful biomarker of acute air pollution effects. Circulating oxLDL has been suggested to be involved in the upregulation of inflammatory genes (Berliner et al. 1995) and expression of cytokines in human blood (Hulthe and Fagerberg 2002). Binding of ox-LDL to its receptor on endothelial cells and on macrophages leads to the expression of monocyte chemotactic protein-1 and adhesion molecules. Additionally, ox-LDL inhibits nitric oxide production and leads to endothelial dysfunction and apoptosis (Li and Mehta 2000a, b) resulting in oxidative stress and inflammation and thus promoting atherogenesis (Cominacini et al. 2000; Mehta et al. 2006). Oxidized LDL in plasma is usually measured with a standardized competitive enzyme-linked immunosorbent assay (ELISA) based on monoclonal antibodies directed against a neo-epitope in the aldehyde-substituted apoB-100 moiety of LDL (mAB-4E6; oxLDL-4E6 assay, Mercodia AB, Uppsala, Sweden). There is no single universal marker for oxidative (and/or) nitrosative protein modification, because 20 different amino acids may be attacked by ROS/RNS and there are 35 or more ways in which proteins can be oxidized (Madian and Regnier 2010). Nevertheless, protein oxidation products are stable, have long half lives and sensitive assays are available for detection (Dalle-Donne et al. 2006). Unlike lipid peroxidation products, protein oxidation products (such as carbonylated proteins and 3-nitrotyrosine) are not subject to artificial oxidation during sample preparation and during prolonged storage in a freezer. Many of the oxidative modifications of proteins involve some type of carbonlyation, which may result in the irreversible loss of protein function (Madian and Regnier 2010). Thus, irreversible ROS-mediated protein oxidation may be reflected by the accumulation of protein carbonyl levels. An increase of carbonyl proteins has been associated with aging and several human diseases such as Alzheimer’s disease, diabetes, sepsis (Dalle-Donne et al. 2003; Levine 2002), and chronic kidney disease (Vaziri 2004). Protein carbonyl levels were significantly higher in patients with chronic obstructive pulmonary disease exposed to tobacco and biomass smoke than in a control group (Ceylan et al. 2006). This is consistent with previous findings showing increased carbonyls in human plasma induced by smoking cigarettes (Reznick et al. 1992; Marangon et al. 1998, 1999). A more recent study reported significant small positive correlations (R = 0.30–0.31) of PM2.5 and PM10 exposure with plasma carbonyl protein concentrations in bus drivers, but adjusted regression models were not tested (Rossner et al. 2007). The protein carbonyl content is considered as the most general and most commonly used index for protein oxidation (Dalle-Donne et al. 2006). Furthermore, a meta-analysis of published results revealed that in many cases levels of protein carbonyls correlate directly with concentrations of lipid peroxidation products (Dotan et al. 2004). Commercially available protein carbonyl ELISA kits can be used for the direct measurement of DNPH-derivatized carbonyl proteins. These assays use anti-DNP antibodies, are reproducible, and correlate well with typical spectrophotometric DNP assays (Rossner et al. 2007). Redox modifications of tyrosine residues to 3-nitrotyrosine by peroxynitrite and other reactive nitrogen species, and by myeloperoxidase-mediated pathways, may lead to disruption of signal transduction pathways mediated by tyrosine phosphorylation, changes in enzyme activities in biological systems, and nitrosative stress (Keng et al. 2000; MacMillan-Crow et al. 1996). Thus, nitrotyrosination is likely to be involved in atherogenesis and thus in the pathology of cardiovascular diseases including coronary artery disease (Beckmann et al. 1994; Shishehbor et al. 2003) among others. Exposure to cigarette smoke and diesel exhaust particles induces protein nitration in vitro and in animal models (Sanbongi et al. 2003; Xiao et al. 2005; Piperi et al. 2003; Yamaguchi et al. 2000). Furthermore, higher exposure to PM2.5 and PM10 showed significant small positive correlations (R = 0.29–0.30) with increased levels of 3-nitrotyrosine in plasma samples of bus drivers, but adjusted regression models were not tested (Rossner et al. 2007). The recommended method for plasma nitrotyrosine detection in plasma requires GC/MS or GC/MS/MS instrumentation (e.g., Tsikas and Caidahl 2005). However, less expensive ELISA methods for screening 3-nitrotyrosine plasma have been reported (Khan et al. 1998). Fluorescent oxidation products in human plasma may represent a more global marker of oxidative stress for epidemiologic studies reflecting stable protein oxidation, advanced glycation end products, and advanced lipoxidation end products (e.g., malondialdehyde; Wu et al. 2007a). They have been associated with risk of coronary artery disease and they were associated with several known promoters of oxidative stress such as smoking and hypertension (Wu et al. 2007b; Mezzetti et al. 2001). The chromophoric structures responsible for the fluorescence are conjugated Schiff bases. However, fluorescent oxidation products in plasma samples cannot be measured directly but require extraction with suitable organic solvents before spectrofluorometric analysis (Shimasaki 1994; Wu et al. 2004). Humans have evolved various enzymatic defenses against ROS generated endogenously (e.g., ROS generated by mitochondrial electron respiratory chain, by monooxygenase enzymes and by cell signaling processes) or originating from external sources (e.g., exposure to redox cycling agents present in air pollutants). More specifically, cellular SOD (MnSOD, Cu,ZnSOD) reduces O 2 − to H2O2, then, in turn, catalase reduces H2O2 to water and molecular oxygen in order to minimize oxidative damage. Among other regulating functions, the selenium-dependent GPx-1 catalyzes the reduction of H2O2 and lipid peroxides to water and lipid alcohols by using the reducing power of GSH. Commercial test kits are available for measuring the activities of SOD, GPX, and catalase in biological fluids by monitoring the generation of end-products (colorimetric end-point detection) or the decrease in the levels of substrate (colorimetric, kinetic assays). Other antioxidant enzymes that can be measured and are potentially involved in effects of air pollutant exposures include NQ01, HO-1, and PON1 as discussed above. The peripheral blood transcriptome could serve as a useful biomarker of oxidative stress-related defense mechanisms in combination with protein expression levels. Systemic responses to air pollution can be measured in human experimental or epidemiologic studies using gene expression levels in leukocytes. In vitro data shows that inflammatory response genes and antioxidant enzyme genes (CuZn-SOD, HO-1, NQO1) are upregulated in human endothelial cells exposed to diesel exhaust particles (Gong et al. 2007). These effects were synergistically upregulated with co-exposure to an oxidized phospholipid. HO-1 was also upregulated in liver tissue of hypercholesterolemic mice exposed to urban ultrafine particles (Gong et al. 2007). Most gene expression and air pollution data has come from in vitro studies (Gong et al. 2007; Hirano et al. 2003; Li et al. 2003; Wan and Diaz-Sanchez 2006) or animal models (Gong et al. 2007; Kooter et al. 2005), but it is unclear whether these findings can be extrapolated to humans. There is little gene expression data from human subjects to support the relevance of experimental results (Wang et al. 2005; Peretz et al. 2007). An experimental study of five subjects showed upregulation of oxidative stress-related genes including HO-1 after diesel exhaust exposure (Peretz et al. 2007). An occupational study of welders linked air pollutant exposure (metal fumes) to within-subject changes in whole blood gene expression related to inflammation and oxidative stress (Wang et al. 2005). Despite a small sample size of 15 exposed welders, they found that changes in gene expression profiling could be measured in whole-blood total RNA using only one pair of pre- and post-work shift samples. Most of the observed expression variations were from only nine nonsmoking welders. They found more up- or down-regulated genes (p < 0.05) in welders (533 genes) than in seven non-exposed controls (86 genes). An inherent limitation is that expression on a transcription level does not necessarily reflect changes on the (functional) protein level. Many transcripts are not being actively translated. Moreover, functional expression depends on protein-protein interactions and/or post-translational modifications. Most epidemiologic research has focused on available exposure data including regulated PM2.5 mass and gasses such as ozone, or general markers of fossil fuel and other combustion sources such as black carbon. However, there is mounting experimental evidence that particle components that contribute little to overall particle mass have the potential for pro-oxidant effects in the body (such as PAH) leading to antioxidant responses, which when overwhelmed at higher pollutant concentrations results in oxidative stress and then inflammation. It is also possible that ultrafine particles are more likely to induce systemic oxidative stress and inflammation than larger particles and that this is attributable to greater surface area and higher concentrations of redox active components compared with the accumulation mode fraction of PM2.5. However, there is little data on this in human populations to conclude whether different particle size fractions have different magnitudes of association with oxidative stress outcomes. Similarly, it is unclear whether there are differences in oxidative stress effects for two general characteristics of organic PM and their precursor volatile and semivolatile components, namely, primary organic aerosols and associated chemicals from fossil fuel combustion such as PAH (that have oxidant potential after biotransformation) versus photochemical oxidants on secondary aerosols such as polar organics. Transition metals may have additional impacts on oxidative stress. There is also limited data on the effects of volatile and semi-volatile organic air pollutants in human populations, especially electrophiles. Finally, the overall oxidant potential of particulate and volatile pollutant mixtures may be more informative with regard to health effects that any specific set of components or source markers (although these are clearly important to identify in efforts to protect public health). A variety of methods are available to measure oxidative stress in the circulation. The best choice of biomarkers for epidemiologic studies will depend on the research aims, but the decision may be difficult based on the current literature. In an epidemiological study where a large number of biospecimens are collected, more accurate measurement methods may be too costly. However, employing methods that are more feasible (e.g., antibody-based assays for 8-isoPGF2α) may result in semi-quantitative data and increased type II error since the measurement error is likely to be unrelated to exposure and the bias is thus towards the null hypothesis. A large sample size may or may not overcome this type of error. Furthermore, the ability to detect an exposure threshold where the balance between oxidant defense and oxidation of cell constituents is tipped toward oxidative stress may be adversely influenced by the limit of detection for the biomarker assay. Therefore, we believe there is a need for a comprehensive assessment of the reliability and validity of biomarkers of oxidative stress for large-scale field studies. The use of a longitudinal design with repeated measures can enhance the representativeness of measurements and information content, and thus increase the utility of more feasible methods for the measurement of oxidative stress. The cohort panel study is a design that is particularly well-suited to the study of acute effects because with repeated measures, each subject can act as their own control, thus reducing variability from between-subject determinants of oxidative stress. Panel studies are particularly suited to assess the time course of exposure-response relations (from hourly to daily or weekly averages and lags) and to evaluate whether one biomarker of oxidative stress or antioxidant response is more closely associated with specific pollutant components than another is using within-subject data. Systemic inflammatory and thrombotic mediators in the blood as well as clinical outcomes should be measured simultaneously to assess the impact of air pollutant-related oxidative stress. Finally, transcriptomic and epigenetic approaches can be used to test and explore biological pathways that are relevant to these clinical and biological outcomes.